When I was in the 7th grade, my middle school went on a camping trip to Havasu Canyon. 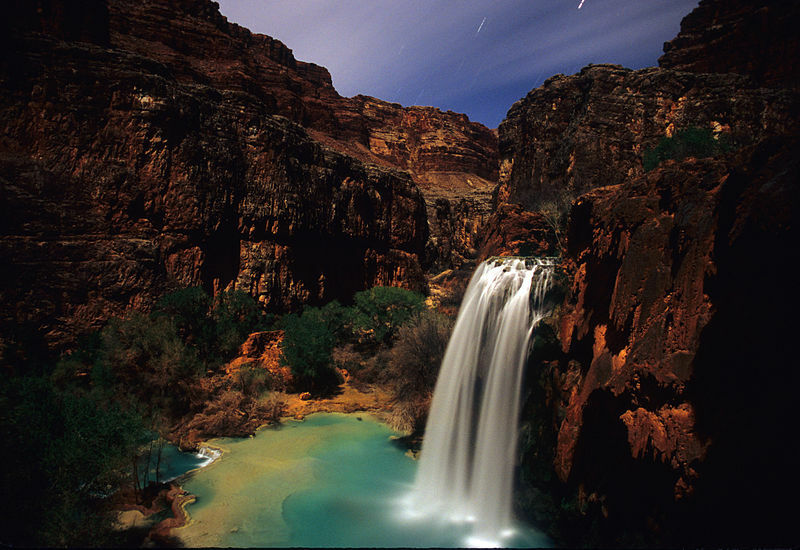 Havasu Canyon is one of the improbable places on this globe. It is a finger canyon of the Grand Canyon. You drive off the freeway in Seligman, AZ, drive a long time on old Hwy 66, turn off and drive an hour on a narrow road to a parking lot carved into an esplanade half way up the wall of a 3000-foot canyon. From there you put on your backpack and hike through 8 miles of desert canyon followed by 4 miles of increasingly fertile canyon and arrive at a tropical paradise beneath a 100-foot waterfall with huge pools carved out by the clear water, perfect for swimming and swinging way out on ropes dangling from tall, ancient cottonwoods to let go, flail joyously through the air to splash down into the deep pool. The campground is about 2 miles below Supai Village, which is the home of the Havasupai Indians and has been in the bottom of that canyon for a good 800 or 1000 years. The village has an excellent cafe. The whole place took on an air of magic for all 60 of us on the camping trip. Just the name Havasu Canyon brings back a flood of euphoric memories and associations for most of my former classmates and me. I can still smell the red dust in my shoes and I still have a strange rock--possibly a meteorite--that I found in the canyon. Yes, this is still a blog about R. A. Lafferty, and I will get back to the Laffertisms in a moment. A few years ago, Pam and the kids and I went to Havasu Canyon over spring break. It is still one of the most spectacularly beautiful places on earth. But the trail, the village, and the campground were dingy. There had been floods in the intervening years, and one of the waterfalls, Navajo Falls, no longer existed. The village population had dropped by about 20%, and the campground stank from the poorly maintained outhouses. I just read Lafferty's "You Can't Go Back" (published in Asimov's and one of Terry Carr's Best Science Fiction of the Year anthologies and later collected in Iron Tears). It is the story of how a bunch of kids found a magic place--a secret moon that hovered (and hid) over the Osage country in Oklahoma. The kids got to the moon by calling it down and climbing up from the roof of their grandma's truck. The moon itself had a village on top and trolls in a cave in its middle (and the village had outhouses teetering on the brink--in danger of falling off the moon into the sky). The place became magical for the kids and they would go back from time to time in their childhood. Much later in life, when the kids are old men, they doubt the place ever existed (I mean it does sound sort of improbable). So one of the characters flies them there in his helicopter, and they visit it one last time. They react this time not with wonder but with repugnance--the place is dingy, the goats give sour milk, the village has shrunk to just four houses, and all but one of the outhouses has fallen off the moon. The whole place stinks from the family of Stinking Yeti that have taken up residence in the trolls cave in the middle of the moon. The whole story, even the title, is one of wistful disappointment with memory--a theme of realizing how rose-colored the glasses of memory are. It is an old man's reminiscence over better times. The story opens with a verse on the evocation of memory. Some bones and pebbles from the moon! "But it is as big as it used to be. It's still about a hundred yards in diameter,"
"Yes, but the yards aren't as long as they used to be," Whelk complained. This quote is key--the yards in the kids measurement seemed much larger than the yards of an old man's evaluation. The grandeur has diminished as they face it with adult eyes. Of course, they are still standing on a moon made of stone and earth that can zoom about in the sky and obey the commands of a properly played moon flute. So their disappointment and repugnance upon their return seems a little forced. It's almost as if Lafferty wanted to write a story about loss and disappointment but couldn't come up with a situation that wasn't magical. So he just forced his characters to mouth words and assume attitudes of disgust. Now nonchalant responses to the magical and impossible are standard features of a number of Lafferty stories. It was part of his stock in trade. I like to compare "You Can't Go Back" to "Narrow Valley." Both deal with an impossible situation presented in a matter-of-fact manner. In both the kids respond to the wonder, while the adults deal with it. However, "Narrow Valley" ends hopefully, with the magic being renewed. "You Can't Go Back" ends with the magic being gone. "Not only has the magic gone out of it, but nothing else has taken its place," Barry Shibbeen mourned. "What's the word for this place? Oh yes, 'dingy'. I could cry." I don't know when Lafferty wrote the two stories. "You Can't Go Back" seems like it was written much later, because the tone in the latter half is bitterly wistful, while the tone in "Narrow Valley" preserves the sense of wonder. I know in my own narrow valley experience, Havasu Canyon is still one of the natural wonders of the world. It turns out that on our last visit, we were there too early in the season--they hadn't cleaned up the canyon and the campgrounds for the summer tourist season yet. On our last day, as we were preparing to hike out, they were airlifting the disgusting outhouses out by helicopter and lowering shiny new ones into place. "Narrow Valley" was written in 1966, "You Can't Go Back" in 1979. I've seen some speculate that the latter was actually his final story, since it does feel like a sendoff or a pessimistic revisiting of so much of his stock in trade. But it wasn't his last story (that, most likely, is the incredibly magical, hopeful, and hard-to-find "Anamnesis"), and I think reading it the way that those folks do (and thankfully you don't, Kevin)—as Lafferty turning his back on all that—is correct in one way and tragically mistaken in another. It's correct in that Ray did seem to be going through a very difficult stretch then, writing-wise, sales-wise, person-wise, and maybe at that time he did conceive of his earlier creations as not all that magical. It's tragically mistaken in that he was just a year away from the remarkable stretch in the early '80s where he rolled out one brilliant novel after another; even if none were big sellers, they did revitalize him, and propel him through to his so-called "retirement" in 1984. And besides, as you note, the basic element of the miraculous—the moon itself—still exists, even if fallen on bad times, it only takes some maintenance and new imagination for it to recover and show forth true splendor again—just like Havasu Canyon in season. Re-reading the story, I somehow got the impression that all it needed was a fresh batch of kids to respond to the wonder for the wonder to be there again. Don't know where I picked up that impression though; it's nowhere stated in the text.